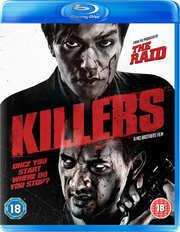 If you like a bit of Japanese cinema, and we certainly do, then you might want to check out Killers, directed by Timo Tjahjanto and Kimo Stamboel, and starring Oka Antara and Kazuki Kitamura. This arrives in cinemas on 18th July and both Blu-ray and DVD this coming 1st September, courtesy of Lionsgate. Alas no details on extras or retail price, but we suspect it will carry RRPs of around £14.99 for the SD release and £17.99 for the HD version. Nomura is a good looking and stylish man in his early thirties who lives a successful life in Tokyo, Japan. Girls are drawn to him, something he uses to his advantage as none of them realise the sinister truth behind the clean-cut façade. When the rivalry between Nomura and Bayu becomes an uncontrollable psychosis, the two of them must face each other in one of the most exhilarating film finales in years.